This PMR report on the global forskolin market analyzes opportunities in the market, and presents updates and insights relating to various segments of the global forskolin market over the forecast period 2018–2026. The report also provides historical data of 2013, along with the estimated data for 2018, and forecast data up to 2026 in terms of value (US$ Mn) and volume (MT). In terms of value, the forskolin market is expected to expand at a CAGR of 8.0% over the forecast period. The current study reveals the forskolin market trends and market dynamics in five major regions - North America, Latin America, Europe, Japan, Asia Pacific except Japan, and the Middle East and Africa. The report also comprises the study of current issues with consumers and opportunities in the forskolin market. The report explores the global forskolin market for the period 2018–2026. The pivotal goal of this report is to provide market insights into the developments of the global forskolin market that are progressively helping transform worldwide businesses that are associated with the same. It is essential to consider that, in the wavering economy, we provide the estimated (Y-o-Y) year-on-year growth rate along with the Compound Annual Growth Rate (CAGR) for the overall forecast, to understand the better analysis and evaluation of the global forskolin market, and to discover equitable opportunities for market participants. Yet another unique feature of this report is the analysis of the global forskolin market and the corresponding revenue forecast, which is also carried out in terms of absolute dollar opportunity. This is generally excluded while forecasting the overall market. Absolute dollar opportunity analysis is highly essential in evaluating the degree of opportunity that a provider can observe to execute, as well as to distinguish the potential resources from a sales perspective in the global forskolin market. The global forskolin market report starts with an executive summary, and the definition of various segmentations involved and their respective shares in the global forskolin market. The report also includes the major macroeconomic factors with an outlook of forskolin in the global extract market. 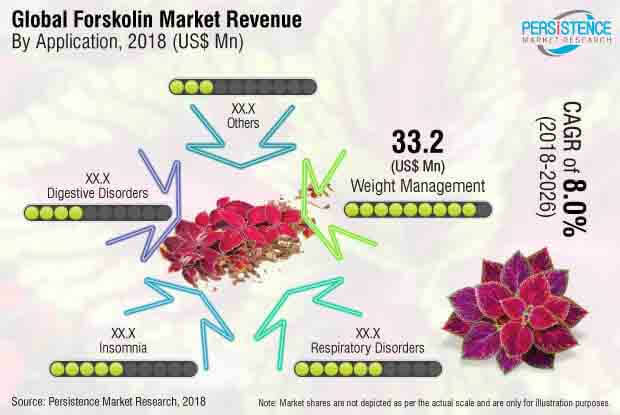 The report further highlights the market dynamics, which covers the drivers, restraints, opportunities, and trends in the global forskolin market. The report also highlights the study of the current issues with processing and opportunities for the forskolin market. It also includes value chain analysis that provides a detailed structural view of profitability from the manufacturer to the end user. In order to provide users with a comprehensive view of the global forskolin market, we have extended the competitive analysis of key market players and their strategic key developments. The competitive dashboard provides a detailed comparison of forskolin manufacturers on valuable parameters such as total revenue, key product offerings, key strategies, and key developments. The study emphasizes the global forskolin market attractiveness analysis by application and concentration. To estimate the overall market size of forskolin, the report considers various preliminary aspects based on secondary research. Furthermore, it highlights quantitative analysis such as region-wise market shares, and market shares by application, concentration, and other qualitative inputs from primary respondents, which have been incorporated to arrive at accurate market estimations. The forecast presented in the forskolin market report arrives at the total revenue being generated, and the expected revenue contribution in the future by the global forskolin market. Detailed profiles of global forskolin manufacturing companies are also included in the report to evaluate their long- and short-term strategies, key product offerings, and recent developments, as they have a significant effect in the global forskolin market. Major market competitors covered in the forskolin market report are Sabinsa Corporation, Nutra Green Biotechnology Co., Ltd., Bioprex Labs, Varion Lifesciences Pvt. Ltd., etc. Forskolin is defined as a naturally occurring chemical compound, which is extracted from the roots of the Indian coleus (Coleus forskohlii), a tropical plant related to the mint family. As a herbal compound, forskolin is used to treat various health complications such as weight management, respiratory disorders, insomnia, digestive disorders, and others. The growing preference for herbal supplements and increasing health consciousness with chemical-free medications among consumers have fuelled the demand for forskolin in recent years. The demand for herbal ingredients such as forskolin in China and India is expected to expand around a growth rate of 9.6% and 9.2%, respectively, during the latter years of the forecast period. This is primarily attributed to the launch of new products with natural ingredients. In Asia Pacific, forskolin has growing opportunities due to increasing herbal medicine industries. Forskolin, a compound native to India and parts of Africa, is bestowed with numerous health benefits. Forskolin compound is a diterpene that plays a major role in the reduction of inflammation. The antioxidants present in forskolin have enabled its use in traditional medicine for thousands of years. Apart from being healthy for the internal body system, forskolin has great application in the cosmetics industry. Increasing weight and health problems are directly linked to poor dietary choices. Growing health complications among children and adults have shifted the preference of consumers to pay more attention towards the ingredients used in food products and supplements, not only for sugar and calories but also for types of ingredients used, such as colors, flavors, sweeteners, and other ingredients. Forskolin helps in the promotion of appetite fullness, thus aiding in weight loss. Owing to changes in consumer preferences seeking healthier and natural products, the demand for forskolin has been driven at a higher pace. More than 2 in 3 adults were considered to be overweight or suffer from obesity. Around 1 in 6 children and adolescents aged 2 to 19 were considered to suffer from obesity. Increasing concerns about the side effects of the chemicals and synthetic additives used in personal care products are fuelling the demand for natural alternatives such as forskolin. The application of a natural skincare product improves skin texture, tone, and appearance, owing to the presence of nutrients required to enrich skin health. Forskolin extracts are primarily added to skincare products due to the various properties associated with them, including antioxidant capacity, antimicrobial activity, and pigmentation inhibition, all of which prevent various skin diseases. Forskolin has also shown to counteract the decreased response of fat cells associated with aging. Awareness regarding the benefits of natural ingredients used in skincare and cosmetic products is, in turn, driving the demand for natural ingredients such as forskolin. Developed over 3,000 years ago in India, Ayurveda, sometimes called traditional medicine, is based on the Indian Vedas. The growing shift of consumers towards plant-based products and therapy has provided ayurvedic treatment with a globally renowned position. The ingredients present in forskolin are known for improving myocardial functioning and coronary blood flow, without causing an increase in myocardial oxygen levels. Ayurvedic practitioners use forskolin for the treatment of heart diseases, gastrointestinal disorders, respiratory disorders, and insomnia. This is mainly due to the unique ability of forskolin to activate almost all hormone-sensitive adenylate cyclase enzymes in a biological system. Building muscles, physical energy, and remaining fit are the key components of sports nutrition products. However, consumers are also embracing ingredients that help maintain their mental health. For this, a number of manufacturers of sports nutrition products are including nutrients that maintain cognitive health too, thus promoting mental, emotional, and physical health. As forskolin is obtained from a plant source, and helps weight loss as well as building muscles, consumers show more interest towards forskolin. Moreover, forskolin boosts the level of the cyclic AMP, which has made it a very popular ingredient for the preparation of nutrition supplements. Thus, with the growing demand for sports nutrition in the coming years, the demand for forskolin is also expected to witness significant increase. Bound to all these driving factors, it is anticipated that the global forskolin market would proliferate in terms of value and volume during the forecast period. Nutra Green Biotechnology Co., Ltd .